Every September, a host of global political leaders descend on New York for the United Nations General Assembly’s annual summit and every year there are one or two leaders whose visits are highly anticipated. If last year it was the Indian Prime Minister Narendra Modi who was visiting the US for the first time after coming to office, this year it was the Pope and the Chinese President Xi Jinping. While Pope’s visit had its own charms, it was Xi’s first state visit to the US and so predictably it generated a lot of commentary on the present state of affairs in Sino-US relations. Though Xi had formally met with U.S. President Barack Obama twice before — once during the US-China Sunnylands Summit in June 2013 and Obama’s November 2014 visit to China – his latest visit happened against the backdrop of worsening Sino-US ties and great turmoil in the strategic landscape of the Indo-Pacific. Japanese Prime Minister Shinzo Abe has managed to move historic defence reforms through the Japanese Diet, enabling Japan to better cooperate with America to defend its interests in Asia in the face of growing dangers from a rising China. The Chinese People’s Liberation Army will also be getting rid of 300,000 soldiers from its ranks in a bid to shed dead weight, reduce overhead, and use the savings to buy more high-tech ships, planes, and make its army leaner and more professional. Chinese President Xi Jinping announced the cuts in a public address after a military parade marking the 70th anniversary of the country’s victory over Japan in World War II. There still remain many unanswered questions about the future trajectory of the new Chinese military reform program but what remains certain is that the Chinese military of the near-future will be very different from the Chinese military of the recent past. And this will predictably cause consternation in the region and beyond. Already regional powers are responding to the rise of China in several ways. China’s disputed territorial claims in the South China Sea and its willingness to assert those claims with a military build-up has rattled some countries in the region, pushing them towards greater military cooperation with the United States. The US has reached an agreement with Malaysia to let American P-8 Poseidon and P-3 Orion spy planes use airbases in the country to spy on China’s activities in the waters off Malaysia’s coast. The Philippines has also welcomed the US plan to deploy air and naval assets to the country as part of the next phase of Washington’s rebalance to the region. The US troops are likely to have access to at least eight Philippine military bases under the Enhanced Defense Cooperation Agreement (EDCA) signed last year between the two states. In a sign of warming US ties with Hanoi, Washington has partially lifted a 40-year ban on providing lethal military support to Vietnam in order to enhance its maritime security. The arms embargo was a major stumbling block on the American side of the road to closer US-Vietnam relations. In a significant change in the communist regime’s attitude toward Washington, Hanoi has decided to allow the US Peace Corps to operate in Vietnam. India too has been recalibrating its regional ties at this time of great strategic flux. China’s display of its military might is prodding New Delhi to invigorate its defence policy and diplomacy to tackle China’s rise in its vicinity. India hosted its first-ever bilateral naval exercise with Australia earlier last month, and will conduct maritime exercises with Japan in November. India has also invited Japan to join its Malabar exercise with the US in the Bay of Bengal after eight long years. Although Australia and India have participated in military events and exercises together before as well, this will be the first time that the two nations will be jointly planning and participating in a military drill of this nature. Non-alignment has been a central feature of Indian identity in global politics that is manifest in continuities: India has been in pursuit of strategic autonomy since independence, which in practice has led to semi-alliances fashioned under the cover of non-alignment and shaped by regional dynamics. In this setting, the rise of China now raises an interesting conundrum for Indian policymakers as New Delhi seeks to balance the benefits and risks of an increasingly assertive neighbor and a network of alliances with like-minded countries. In order to effectively balance China’s growing influence, India has become more assertive in building these alliances, as the success of its modern-day pursuit of strategic autonomy may well rest on a strong foundation of strategic partnerships. The coming to office of the centre-right National Democratic Alliance government in May 2014 has signaled a move away from even the rhetoric of non-alignment with significant implications for the future of Indian foreign policy. This theme is fully explored in my International Affairs piece, here. 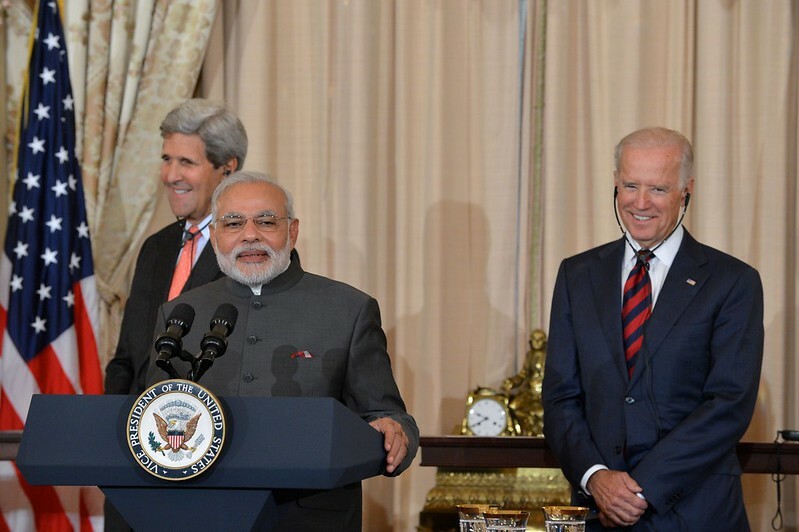 Photo: Indian Prime Minister Narendra Modi delivers remarks at a luncheon co-hosted by U.S. Secretary of State John Kerry and U.S. Vice President Joe Biden on September 30, 2014. Courtesy of: State Department photo/ Public Domain.